Plenty of room for up to two DSLRs and lenses with space for batteries and other accessories. Very high quality canvas bag fully padded. Rain cover underneath bag. Photos - these pictures are of the actual item up for sale and provide a clear indication of its condition. Adjustable Internal Padded Divider. Removable & Adjustable Shoulder Strap with Pad. Depth 7” (18cm). Depth 4” (10cm). Width 6” (15cm). 4 internal sponges with removable performance. Enough space，flexible and easy transporting. We will try our best to reduce the risk of the custom duties. Detail Image. Padded Camera Bag. Excellent Cond. Divided Pockets Plus Separate Lens Holders. 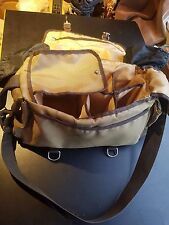 Vanguard Divider Bag 40. We will always help you to have a 100% positive happy buying experience. Thick, soft padding provides cushioned protection for gear. Removable and adjustable dividers. Weight(lbs): 1.98. Designed by Belkin. Positional dividers x 2. Highly portable multi-purpose toppled bag with shoulder strap. Two side accessory pockets. One large front accessories pocket. Internal Net pocket. Brand new, Never used! Features: 1. 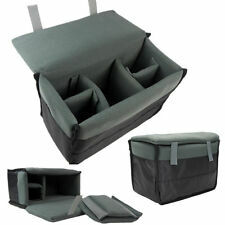 DIY your own bag: The interiors are completely adjustable or removable, with 5 foam-padded dividers can be constructed into 6 small partitions 2. Shockproof, The liner is made of Velvet, with good shockproof performance 3. Waterproof high density nylon construction with padded liner and detachable divider offers your camera a good protection 4. It is enough for storing a DSLR/SLR camera and a camera lens, well matches your backpack or shoulder bag. Sturdy material makes it bear heavy stuffs and won't deform easily. This product is made of polyester material which makes it durable, waterproof and shockproof. Its foldable design ensures you an easy storage experience. Features: 1. DIY your own bag: The interiors are completely adjustable or removable, with 5 foam-padded dividers can be constructed into 6 small partitions 2. Shockproof, The liner is made of Velvet, with good shockproof performance 3. Waterproof high density nylon construction with padded liner and detachable divider offers your camera a good protection 4. It is enough for storing a DSLR/SLR camera and a camera lens, well matches your backpack or shoulder bag. Mantona Loop is an innovative and individual designed sling backpack for fast access in one simple pull. You have your camera ready to shoot without taking it off. You just pull the bag to the front and you have your equipment ready to use. Two additional clips also garantuee that your equipment won’t fall out of the bag. You can open the bag widely in case you want to take it off. The upper compartment is perfect if you want to take other belongings like wallet or cell phone with you and the dividers in the camera comparment allow you to adjust the space to your needs. The rain cover and stable padding protects your contents from rain and other impacts. The front pocket provides space for charger and SD-Cards and other smaller gadgets. The padded shoulder strap and abdomi. 4 internal sponges with removable performance. Enough space, fle x ible and easy transporting. The shockproof lining is made of velvet material with good shockproof performance. - Material: Velvet. Size of Divider 8" x 3.75". Size of Pocket Patch 5" x 5.5". 4 internal sponges with removable performance. Enough space, fle x ible and easy transporting. Material: Polyester. It is can be attached to the belt too. International can be set upon request! I am here for help and resolve any problem. 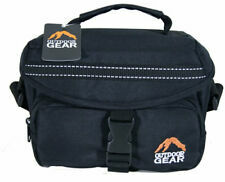 It’s fitted with removable and adjustable shoulder strap. Although is used I would describe it as very good condition. Protects your photo gears and other accessories from scratches.